Every now and again some state mandarin will make a statement that reminds people (ok, me) of Monty Python’s “Flying Circus”. Rather than leave the strutting and fretting to petty functionaries in the Ministry of Silly Walks, these senior ministers take it upon themselves to shower us with their precocious platitudes. And the results are chaos, confusion, consternation. Note first the casus belli given below. A.The State Minister of Finance this week called for the establishment of a ‘meritocracy’ built on the principles of ‘good governance’. He invoked the participation of various non-state actors – including the private sector – in this, er, meritorious act. That politicos are part of the problem in perpetuating a culture of corruption and nepotism he was not loath to admit. Be that as it may, the sovereign people of any democracy worth its salt must ensure that politicians don’t usurp their privileges in this regard. While politicians can continue to nominate their prospective appointees to state sector positions, the public must challenge the prerogative of their elected representatives to make such appointments by acting unilaterally. Every government nominee must be vetted for suitability. He surmised that the proposed new constitution may create a culture where government appointments are made on merit and not at the whim of ruling politicians. B.This meritocracy is challenged by the business community when it claims that it does not matter if some corruption exists – so long as the whole system works efficiently. Challenging the private sector to deal comprehensively with this stumbling-block to good governance in the corporate sector, the state minister emphasised the imperative to create a ‘meritocracy’. The former senior banker with over a quarter of a century’s experience in the private sector averred that establishing ‘good governance’ requires the participation of the private sector. He added (in case no one had realised the precariousness of our position) that “for every bribe taker, there is a bribe giver”. Passing the buck for the responsibility of rectifying this culture, our sea-green incorruptible affirmed that if everyone waited (as they had been waiting for the past 70 years) for governments to deliver – presumably on the promise of eliminating corruption in its hydra-headed forms, in the case of this administration – “we will be waiting another 70 years”. C.There has been some movement towards a change in dominant paradigms, our mandarin affirmed. Such a cultural shift is taking place before our very eyes, whereby even government ministers are now compelled to step down from office as a result of ongoing investigations into their allegedly suspect activities in the fiscal and financial spheres. But the incumbent administration has been criticised for both its ostensible complicity in dubious bond auctions and unconscionable dabbling in hedging. So this semi-formal spokesperson for the government felt it was incumbent on him to asseverate that those who had trespassed against the law must pay for their crimes, particularly if they had robbed the public. In the meantime, these two under-fire mechanisms need not be done away with. “We don’t throw the baby out with the bathwater,” he is reported as saying. The state minister means what he says and says what he means. That we must establish a meritocracy through the good offices of transparent and accountable government is non-negotiable. There must be private sector buy-in to this so that the excellence we see in the incumbent administration is sooner than later reflected in Corporate Sri Lanka. However there is dissent in business chambers because as everyone knows there is a giver of bribes for every taker of bribes. Therefore everybody must cooperate with the best of good governments presently in situ to eliminate the insidious cancer of corruption that is corroding the fabric of society. The state minister can’t possibly know what he is saying. That we can establish a meritocracy through the good offices of transparent and accountable government is a non-starter at present. There can’t be private sector buy-in to this because the egregiousness we see in the incumbent administration – to say nothing of the immediate past regime that was rotten to its core – is already mirrored in what Corporate Sri Lanka countenances. Therefore the dissent against democracy and meritocracy in business chambers is because everyone knows who the takers of bribes are as much as they know who the givers of bribes are. However it is clear that everybody must cooperate with the best of a bad lot presently in situ to pre-empt the possible return of the king and countrymen of corruption who once ruled the roost – and still would, given half a chance. The state minister intends to say much more than he really appears to mean. That we must establish a meritocracy despite the worst excesses of transparent and accountable government is non-evident to many if not most. 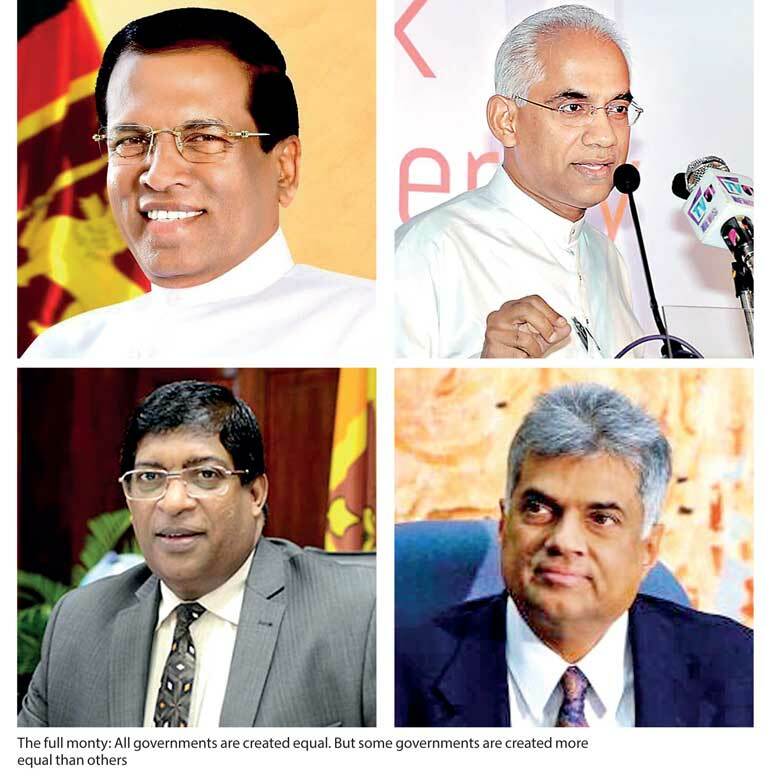 There must be more than private sector buy-in to this, because the excellence we wish to see in the incumbent administration must not be allowed to be refracted by anyone in Corporate Sri Lanka or anywhere else… not even – not especially – the government of the day, be that what it may. Because there will always be a giver of bribes for every taker of bribes, good governance can and must begin with the business community. Therefore everybody must cooperate with the best of good governments presently in situ to eliminate the insidious cancer of corruption that is corroding the fabric of society. No, really. Whichever view you may take – take the tests below. All you can do is scrape through, which is no better or worse than is being done by Corporate Sri Lanka and Constitutional Reform alike. 1.To ensure that a meritocracy works, we need our public to be proactive. True? False? Wishful thinking? 2.Govt. cannot achieve Good Governance alone. Yeah? Right! Told you so, dummies! a.They are interested in people over principles. b.They are partisan to their parties’ values or vested interests. c.They are opposed to dumping interesting people with gay abandon. d.They are failed individuals who trust in systems over principles or values. a.Arguing makes your case more convincing to the media and other impressionable minions. b.Bonding is better for best buddies under good governance than coming unstuck. d.Defending the indefensible is par for the course in playing one’s part as a defender of the faith. a.Aiming to create something where nothing existed before looks good on a CV. b.Bribe-givers and bribe-takers are doing too thriving a business without it! d.Democracy means we’re free to do what our masters merit as that which matters.